Happy Wednesday and happy WIAW! Unusual for me I was a very good girl and ditched my home office day and dutifully went to the office. I have a lot on my to-do list and I knew working from home today was very likely not to happen. Today the weather is nice and so I would rather have done anything else than concentrate on boring tasks. So I tricked myself and chose the office over the sofa or even Starbucks. I am stupid, I know! Yesterday was one of those insanely hungry days when you just feel the need to stuff your face with whatever you can get your greedy little fingers on. Yesterday my new bento box had its debut. I love love love it! My sister, cousin and my cousin’s boyfriend (is there anything than a cousin-in-law???) gave this box to me for my birthday last month but unfortunately according to difficulties in delivery I only got it this easter weekend. Isn’t it just fab? So what was hidden in my lovely shiny new toy? Have I ever mentioned I am a sucker for anything pretty? Most probably I have! 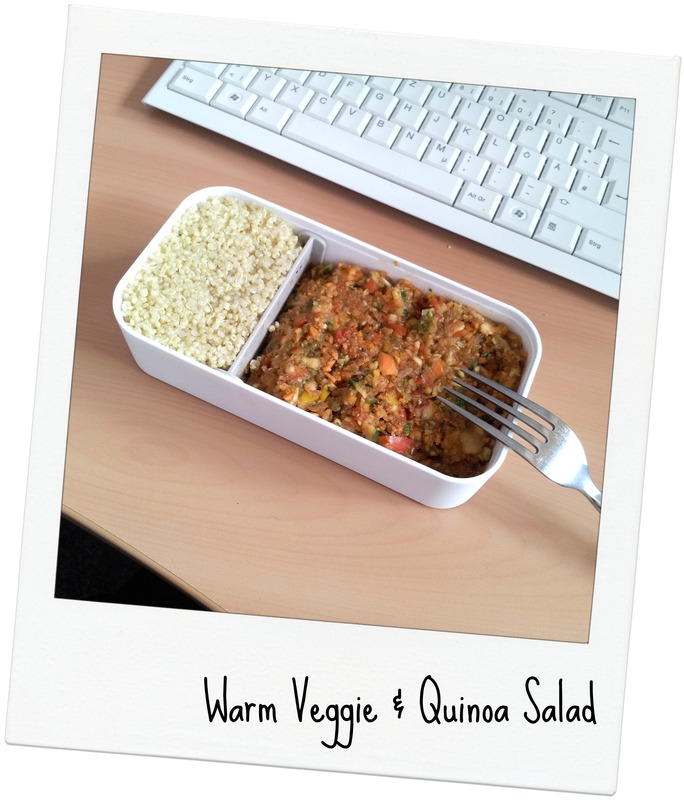 For lunch – or more a late 2nd breakfast as the clock had hit barely 11am – I had a warm veggie salad with quinoa as a side. I had underestimated my hunger and this little bowl didn’t saturated my hunger but made me ravenous instead. I hadn’t packed anything else as we were to leave work at 1:30 pm. Stefan had a doctor’s appointment in the afternoon. On the way back home I stopped by the organic supermarket and quickly grabbed a spelt cheesecake for each of us. This little thing is so good! And I love cheese cake! When we arrived at home I was almost shaking of hunger and I reckon it’s needless to say that I almost inhaled the little tartlet. So sorry, no picture! Then I found cottage cheese in the fridge! Today I suffer the aftershocks but hello, it’s cottage cheese. It’s worth it! Then I found some lovely chocolate easter eggs that are now history. Before I could start to faceplant some cheese I fled the house left for my Power Plate Training. The training really was intense yesterday but I was happy with my performance. Maybe because of all the sugar that played roller coaster with my pancreas! Then I came back home and started to prepare dinner. 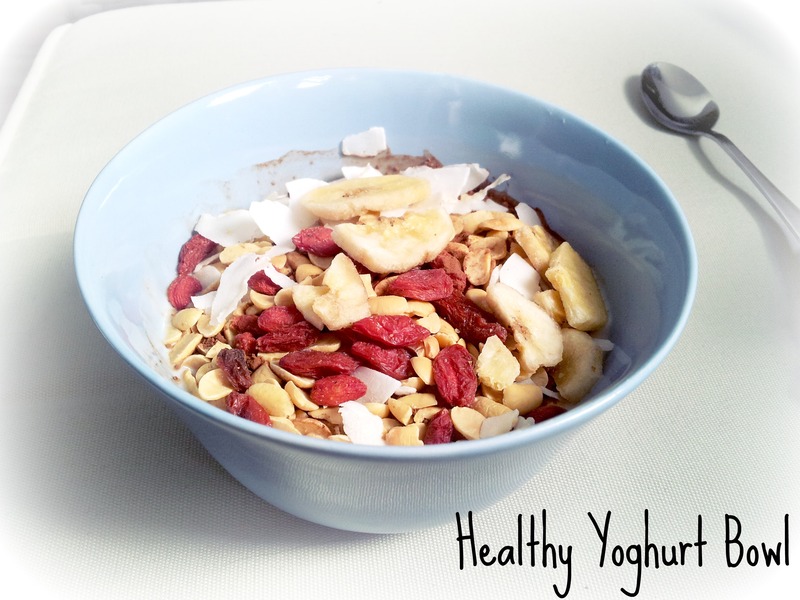 In the course of that process I imbibed a Yoghurt Bowl. Luckily I was saturated enough for an hour or so afterwards. My hunger really was insane! Okay, now I am playing perfect employee and work my way through my never-ending to-do list. No just kidding. I actually really need to work on my dissertation today. So the morning is for work work, the afternoon is for dissertation work. I am actually really looking forward to analyze the interviews now. Should be hopefully quite insightful! Happy Wednesday Bloggie friends! Have a great day! 🙂 And many thanks to lovely Jenn, for hosting this fantastic link-up! Okay, question….what is chufli? Is it a cereal? (I could probably google it but I’m lazy…and hungry). Oh damn hungry days. ALWAYS strike when you least expect it. For me, it happens ironically on mornings I wake up full. I brought a bento box back from Japan but never use it because it barely fit one of my meals in it! 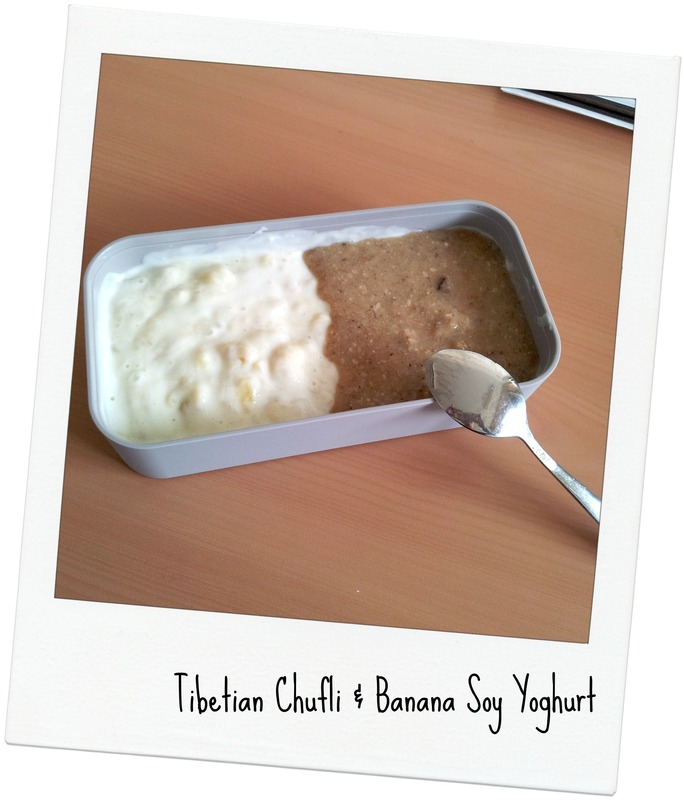 Chufli is a porridge made of barley, tigernut and dates. I want a box like yours. Its quite amazing. I am amazed by how much it can hold. So cool. Everything looks great – especially your dinner. 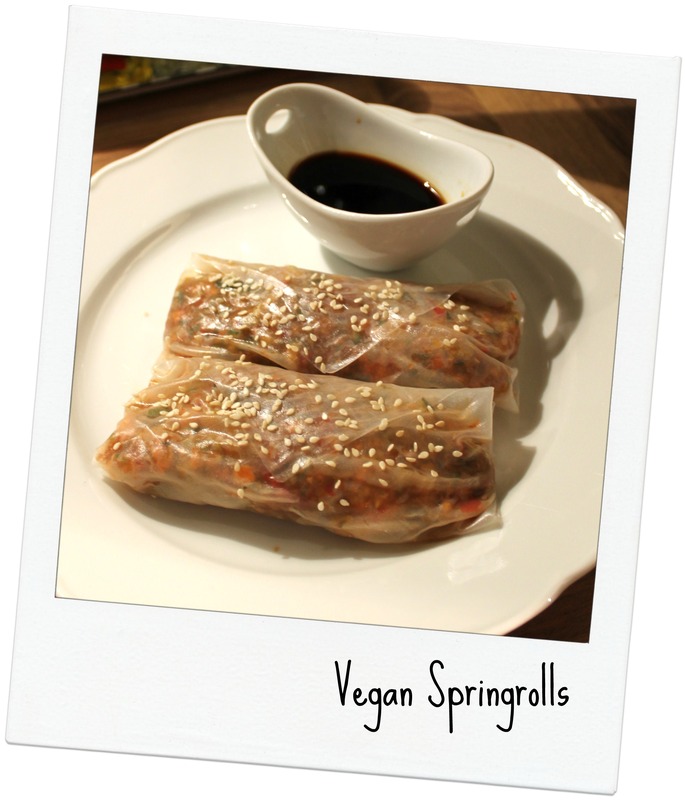 Your spring rolls looked so yummy! Did you make them yourself? Thanks! I am totally trying this out soon! You’re welcome 🙂 Let me know if you ever try them. The Monbento boxes have been calling my name for a while now, too. Are they as good as they seem? I mean, sure, you said you were happy with them but I’m super picky :). Are they drip-safe and keep the food warm for a few hours? So far I’ve only gotten one thermos that actually doesn’t leak and keeps my food hot until I get to eat. Enough bento box talk, though, your breakfast sounds awesome. I can’t allow myself to splurge on the Chufas porridge mix right now but adding a side of banana soy yogurt to my oat bran sounds really good. So far I can say that it’s drip-safe but I can’t say anything about keeping the food warm. I usually fill in cold food. As soon as I get a chance to ckeck that out I’ll let you know. Oat bran does sound good! I think need to make me some this week! Love those boxes! And oh how I know about hungry days. They are amazing aren’t they? One day you are completely satisfied with what you eat and than the next you are hit with that bottomless pit feeling. Uuuh, I love bento boxes. Got my self one in Düsseldorf a while ago, but somewhere along the road I did lose the band that keeps it closed. 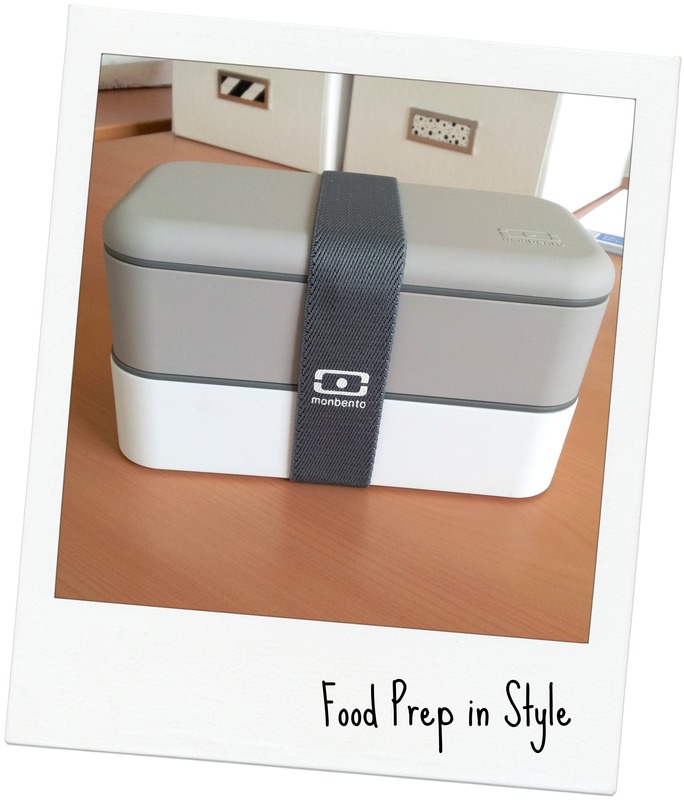 Bummer 🙁 Hope I’ll find something similar, so that I can use it again for office lunches as soon as I have a new job. I do mostly fill it with Asian dishes though, but I like your alternative take on the whole bento thing.